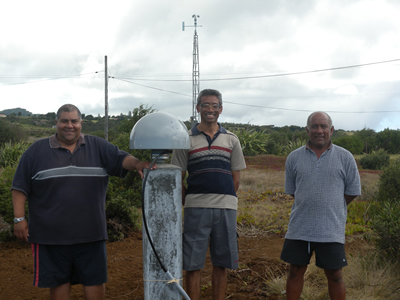 The St. Helena Island Meteo office is now home to a permanent GNSS station on the island. The station is providing a one second stream of GPS + GLONASS data on the newly constructed pillar monument. The installation of this station was a collaborative effort between NASA-JPL, UNAVCO, SEGAL (UBI,IDL) Portugal, and the St. Helena Meteo office. Rui Fernandes (SEGAL (UBI,IDL) Portugal) traveled to the station to facilitate the installation of the monument for the GNSS station. Equipment was configured and shipped by UNAVCO with JPL handling the data offloading. Travel to this particular part of the world can be difficult as there is no airport on the island. The island is only accessible via boat, the Royal Mail Ship (RMS). Travel in one direction takes five days, and the boat docks at St. Helena for only three days. The photo to the right shows Marcos Henry (key facilitator) in the middle, along with other staff members from the meteo office who helped with the monument installation. This GNSS station will potentially offer an interesting collocation with the DORIS station which has been there for 17 years, and covers the 3 different positions: HELA, HELB, and HEMD, for which there are precise "intra-technique" local tie surveys. The station has been proposed to the IGS. The organization that runs the DORIS station will be doing a local survey there soon in order to tie the GPS station to the DORIS station.